Gulf of Mexico's Deep-Sea Ecosystems Collection. Please see the online professional development offering for Lessons from the Deep: Exploring the Gulf of Mexico's Deep-Sea Ecosystems, archived here. Around 10:00 pm CDT on April 20, 2010, a gas explosion occurred on the mobile offshore drilling unit Deepwater Horizon about 40 miles southeast of the Louisiana coast. The explosion killed 11 workers, injured 17 others, ignited an intense fire that burned until the Deepwater Horizon sunk 36 hours later, and resulted in a massive release of crude oil that is now considered the greatest environmental disaster in U.S. history. The total volume of oil released into the Gulf of Mexico has not been determined, but exceeds 30 million gallons, dwarfing the 11-million gallon Exxon Valdez spill of 1989. Ecological impacts of the released oil have received extensive media attention, particularly those affecting beaches, marshes, birds, turtles, and marine mammals; but other, less visible, organisms may be affected as well. Many scientists are particularly concerned about the unusual and biologically-rich communities on the Gulf of Mexico seafloor. Two types of ecosystems are typically associated with deep-water hardgrounds in the Gulf of Mexico: chemosynthetic communities and deep-sea coral communities. Hydrocarbon seeps may indicate the presence of undiscovered petroleum deposits, so the presence of these ecosystems may indicate potential sites for exploratory drilling and possible development of offshore oil wells. At the same time, these are unique ecosystems whose importance is largely unknown. Between 2001 and 2009, NOAA’s Office of Exploration and Research (OER) sponsored eleven expeditions to explore deep-sea organisms and ecosystems in the Gulf of Mexico. Some of these sites are within a few miles of the Deepwater Horizon well. Each of these expeditions was documented with an extensive Web site that included lesson plans for educators at grade levels 5 through 12. OER’s Gulf of Mexico Deep-Sea Ecosystem Education Materials Collection includes a selection of these lesson plans together with new lessons and additional background information about the Deepwater Horizon blowout event. The purpose of this collection is to provide a foundation for student inquiries into deep-sea ecosystems, and to build capabilities for comparing data from OER expeditions with post-event information as the latter information becomes available. 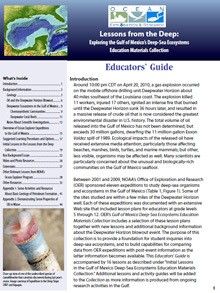 The Gulf of Mexico Deep-Sea Ecosystem Education Materials Collection is comprised of an Educators’ Guide providing background information, as well as 16 associated lesson plans. Additional lessons and activity guides will be added to the Collection as more information is produced from ongoing exploration and research activities in the Gulf of Mexico. Lessons included in this collection touch on a wide variety of topics related to physical science, life science, and Earth science, and offer many opportunities for cross-curricular activities involving social studies, language arts, mathematics, and fine arts. In addition to formal lesson plans, Web pages for most OER expeditions include a variety of background essays as well as photo and video collections. These materials may be used in a variety of ways to enhance class discussions and student research. Lesson plan links are also listed below for your convenience.